Homeschool families know the value of good penmanship and many introduce copywork as an aid to good writing. But, did you know that copywork can also help your child be an outstanding speller? Copywork is copying out by hand from a written source. The value of copywork is to instill the mechanics of great writing. Children learn proper grammar, spelling and phrasing through copying great literature. Charlotte Mason, a British educational reformer, recommended the use of copywork as a beginning point for spelling. Charlotte Mason saw transcription as an introduction to spelling. Children are encouraged to look at the word, see a picture of it with their eyes shut, and then write from memory. Plain and simple, this was the means she used. How does it help my child spell? When reading, the eye slides over the word. 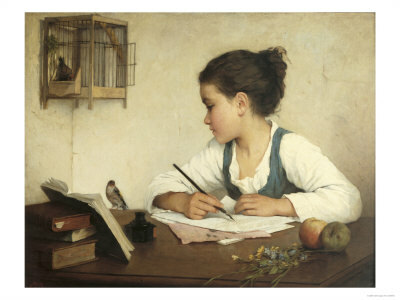 For copywork, a child must slow down and analyze the individual words in order to transcribe correctly. In the process the child sees the word as it is, that is correctly and it makes an impression on the mind the will be brought up when the need arises to spell. Is copywork different from penmanship? Penmanship is the first step in copywork. A child learns to form each letter through practice. Then, when doing copywork, letter practice is the primary goal. Second is to use well-written, high-quality quotes from literature to inspire and delight. Is copywork only for penmanship practice? Yes. It begins as letter formation practice. Once these are mastered, it is for exposure to the best in writing. Copywork done properly forces a child to slow down and absorb the punctuation details, notice capitalization, and internalize sparkling prose. When should I start copywork with my child? What are the very best sources for copywork? Bartlette’s Familiar Quotations (for quotes by topic).